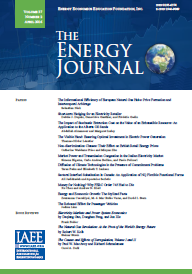 Energy markets in many countries have been extensively liberalised in recent years as part of the revival of market economics. However, though ,everyone may believe in markets now', there are differences of opinion about what constitutes a competitive market. The perfect competition paradigm persists and leads to demands for state regulation to counteract 'imperfections' anti failures'. Energy economists should look more sceptically than they generally do at these calls for regulation, most of which have little to do with the 'public interest': in the long run the accretion of regulation may lead back to extensive state control. Spending on electricity energy-efficiency programs was responsible for most of the growth (and decline), and almost all of the energy savings from U. S. utility demand-side management (DSM) programs between 1990 and 1998. As a result of restructuring, utilities may never again assume such an important role in promoting electricity energy efficiency. However, as governments consider future domestic policies to promote energy efficiency in response to global environmental commitments, the potential of large-scale energy efficiency programs will likely be discussed. This article presents new information on a critical issue that will surely arise in these discussions: how much does it cost to save energy through programs that use monetary incentives and targeted information to influence individual customer decisions? We present findings from a detailed examination of the complete costs and measured energy savings from the largest commercial sector DSM programs operated by U.S. electric utilities in 1992. We extend the methodological considerations first identified by Joskow and Marron (1992) regarding differences among utility cost accounting conventions and savings evaluation methods. We quantify the impact of missing and incomplete data and, to the extent they can be assessed, demonstrate that our assumptions to address them are conservative in that they err on the side of overstating the apparent cost of saved energy. We find that the programs, as a whole, have saved energy at a cost of 3.2c/kWh. When compared to the cost of the energy they allowed the sponsoring utilities to avoid generating or purchasing (in the absence of these programs), we find that the programs, as a whole, are cost effective. Being able to disaggregate total energy demand into components attributable to specific end uses provides useful information and represents a primary input into any attempt to simulate the impact of policies aimed at encouraging households to use less energy or shift load. Conceptually the estimation problem can be solved by directly metering individual appliances. Not surprisingly, this has not been widely practised and by far the most common estimation procedure has been the indirect statistical approach known as conditional demand analysis. More recently, with access to limited direct metering, both approaches have been used in combination. This paper reports on a substantial modelling exercise that represents a unique example of combining data of this type. The distinctive aspects are the extent and richness of the metering data and the fact that optimal design techniques were used to decide on the pattern of metering. As such, the empirical results are able to provide a very detailed and accurate picture of how total residential load is disaggregated by end uses. Significantly, the consumption of high penetration end uses such as lighting, which cannot be estimated by conventional conditional demand analysis, has been successfully estimated. Also, by matching our estimates of end-use load curves with some recent prices paid by distributors to purchase electricity from an electricity market pool, we have been able to determine the costs to distributors associated with servicing individual end uses. This paper estimates short- and long-run marginal production costs and returns to scale in electric power generation in the United States. We find substantial short-run diseconomies of scale at high output levels. A relatively large number of small and mid-sized firms have optimal capital stocks below actual levels. In contrast, several large firms have optimal capital stock targets, substantially above current levels. These disparities in actual and optimal capital' suggest a possible consolidation in the industry. Extracting Common Oil: Cooperation or Competition? This paper considers how likely it is that a given number of agents who share a homogeneous oil reservoir will exploit the reservoir for their common benefit. A game-theoretical model is used, examining whether one agent would profit from deviating from the cooperative strategy, given that the remaining agents would follow a subgame-perfect retaliation strategy. The paper also, examines the sensitivity of the cooperative solution to the number of agents, the, time it takes to discover a deviation, the value of production relative to, investment, and the discount rate. It isf ound that the cooperative solution is very sensitive to the number of agents; with more than three agents the cooperative solution becomes very unlikely. This study draws on other studies that concluded OPEC is not a cartel and Saudi Arabia acts as a dominant producer in the world oil market. The intention here is to see whether the Target Revenue (TR) model provides an explanation for the behavior of some OPEC members that do not coordinate production with Saudi Arabia. We investigate whether production cuts or increases by OPEC and non OPEC members are based on their investment or budgetary needs. By retesting the TR model, we show that investment and budgetary needs do not affect the production of oil in free-market economies (OPEC and non-OPEC), but they do affect production decisions of the more centrally-planned, isolated and oil dependent economies. Existing studies in the literature have conceptual and statistical limitations that justify retesting the model. This study is the first to investigate the TR model in a separate study and to compare the results of static and dynamic models. It is also the first to examine the relationship between the degree of economic freedom and the Target Revenue model and to note the TR model is stable when used for countries that are price takers. A Note on Vertical Integration and Stock Ratings of Oil Companies in the U.S. This note examines some evidence for a link between profitability of oil companies and operational vertical integration into pipelines and crude oil. All empirical specification is estimated using ordered probit. Levels of integration into pipeline and crude that maximize stock ratings are derived using recent oil company data. Integration into pipelines has a weak positive effect on the stock ratings of oil companies, and integration into crude oil has a stronger positive?effect.